Medite COT 20 Continuous Linear Stainer Closed Model Charcoal Filter 20.500 . New Life Scientific, Inc. This instrument is in good shape, but does have noticeable yellowing compared to a new model. However, there are few dings or scratches in the system. It's guaranteed to be fully functional, but it will require the end-user to purchase a few additional stations. The pricing for some of those options can be found below. The Medite is in great cosmetic condition and was confirmed functional by thoroughly testing the slide holder transport. The COT 20.500 features a drain (10 seconds) and stain timer, adjustable up to 10 minute exposure. The stain, drain, and agitate buttons are functional and are used to control slide treatments for regular and sensitive specimens, preventing sample damage or loss. 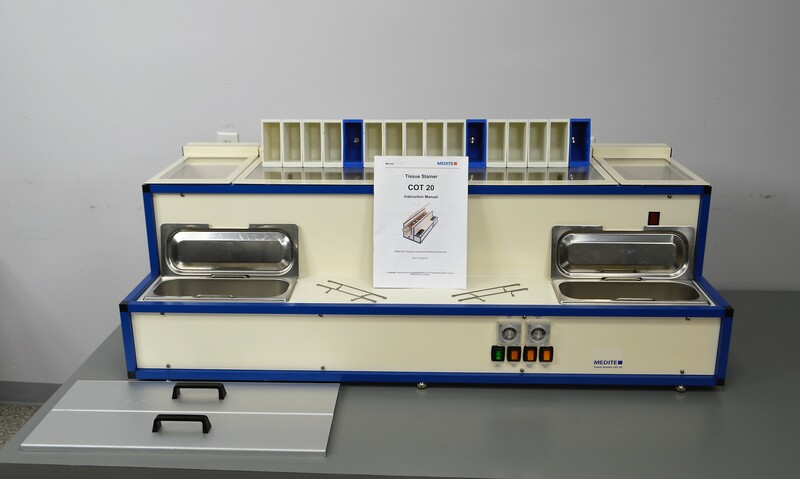 The Medite slide stainer is uniquely simple and mechanically reliable to meet a laboratory's needs with less downtime and maintenance required. The 20.500 closed model features integrated filters and is sold as the top-of-the-line option.